The tool used by many of Twitch's most popular streamers is completely free and open source. OBS Studio (formerly Open Broadcaster Software) is now available in version 19.0.3, with installer downloads available for Mac and Windows, and repositories available for a variety of Linux flavors. The free, open source software for video recording and live streaming lets users record multiple sources simultaneously, including webcams, the desktop, and even individual windows. OBS Studio combines the sources and streams the output to services such as Twitch.tv and Facebook Live. OBS Studio is one of the most popular tools for streaming to Twitch.tv. At any given time, nearly 1-million people are watching live, and thousands are streaming. Most users stream video games. Chantal "Sylvanas" Frey, a streamer from Germany, streams to Twitch.tv four or five times a week, usually playing the game Overwatch. Chantal "Sylvanas" Frey playing Overwatch. 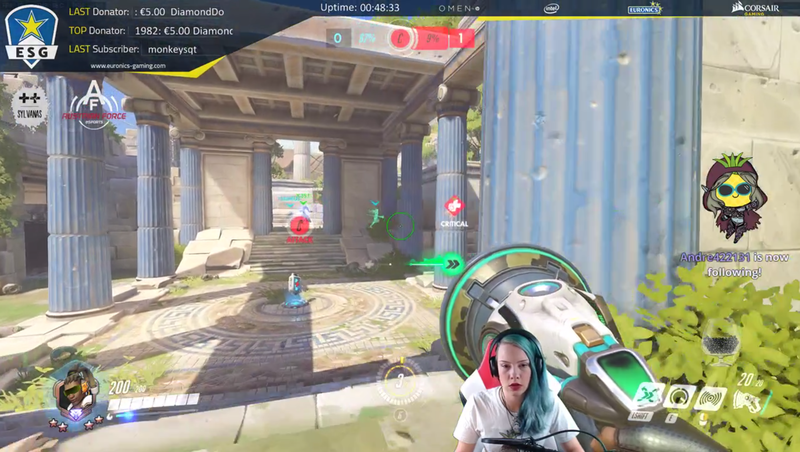 She adds a webcam feed and sponsor logos to her stream using OBS. OBS Studio is developed by a small team working in the open. Most of the code has been written by jp9000/Jim, but several other developers also have made serious contributions to the project. OBS Studio's main website has many active forums in which users post plugins that they have created, resulting in a rich plugin ecosystem. The project has two active IRC channels: #obsproject for user chat and support and #obs-dev for developer chatter. Users can click Community Chat on the website and be taken via a web bridge to QuakeNet, where a group of helpful support volunteers answer questions and help users solve their issues. 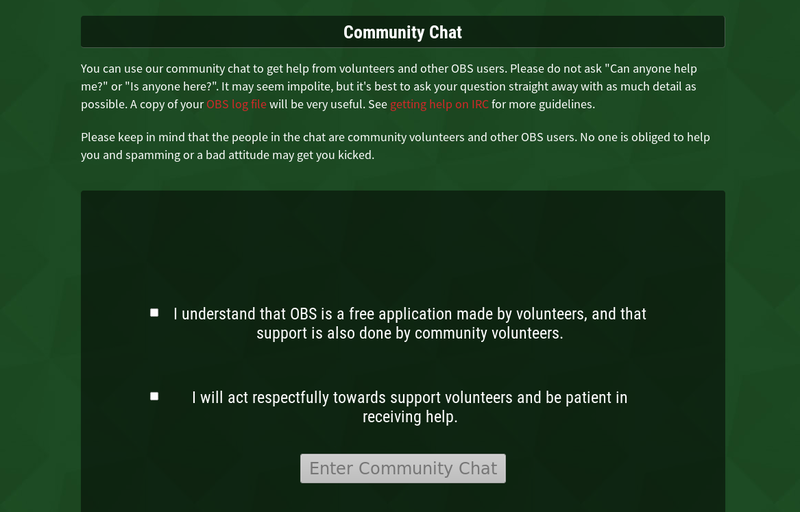 Users who click Community Chat on the OBS website must agree to be polite before they are taken over a web bridge to QuakeNet. Caroline "omgvandi" Vani is a freelance graphic designer and streamer on Twitch. As part of her graphic design business, she designs graphics and overlays for streamers. Streamers use OBS Studio, combined with static graphics and animated browser sources, to create eye-catching streams. Webcam video source: "Some people have a green screen. 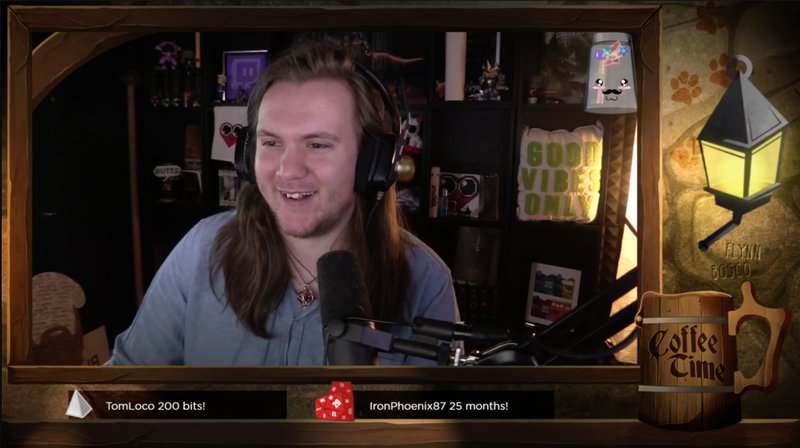 Most have the straight camera box, and the best have a real-life background that fits the style of the stream," she says. Game capture: OBS Studio can capture full-screen games, windowed games, or the raw desktop. A browser source that displays new followers, new donations, and subscriptions. Browser sources are dynamic web content rendered onto the stream. Static or animated graphics to provide borders and branding: "My job as a graphic designer is to ... create the visuals that go into browser sources, or to create a static PNG overlay that goes on top. Static PNG overlays are pretty standard for people [who] don't have a ton of money to spend on custom designs. They look really good, they're clean; most of them can be nice and simple," omgvandi says. omgvandi uses OBS to layer the webcam source and social boxes over the game screen. Note the box around her webcam and Twitter and Instagram tags. The border and social boxes (overlay assets) are created separately using graphics editing software. OBS Studio is then used to layer the game, followed by the webcam source, and finally the overlay assets. 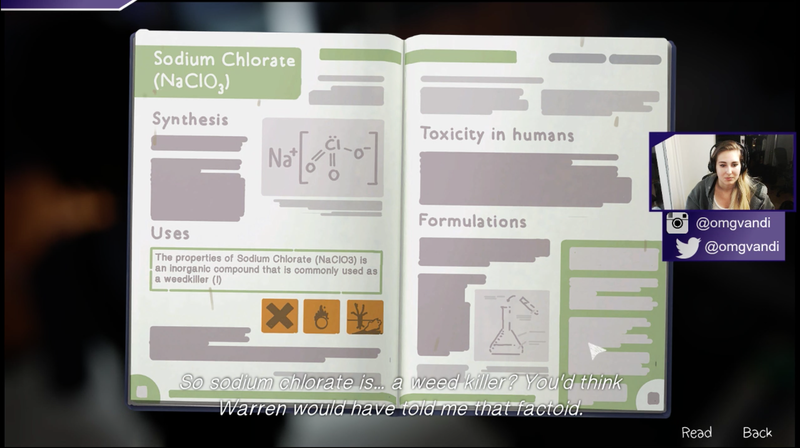 Streamer Brotatoe's webcam focus screen shows use of graphics and dynamic web content to display the names and values of recent supporters. OBS Studio has a huge and engaged user base, especially when you consider the size of its development team—one main developer and a few volunteers, none of whom are paid for their work. Its official Twitter account has more than 95,000 followers. When the DD-WRT Linux-based firmware for wireless routers first came out, one of its lines was "Turn your $50 router into a $5,000 router." The explanation was that this piece of software offered features that were otherwise available only in expensive professional devices. That is essentially what OBS Studio does: It gives streamers control over their broadcasts that until now hasn't been seen outside a professional TV network or sports broadcast. OBS Studio is technically solid, and what users can do with it is flat-out impressive. In this age of corporations supporting professional developers on projects such as OpenStack, Docker, and Kubernetes, seeing a small, self-sustaining, and successful free and open source project—not to mention a desktop app project like OBS Studio—is exciting. Even more impressive is the project's large user base, including many users who don't use it based on the license. I asked Sylvanas, "Did you know OBS Studio is open source? What does that mean to you?" "Never thought about it," she replied. Spencer Krum - Spencer is a developer advocate inside IBM's Digital Business Group. He has worked in several Open Source communities including Vox Pupuli and OpenStack. Spencer helped with the DevOps meetup in Portland as well as DevOpsDays PDX. Now living in Minneapolis, Spencer is a data scientist in training, working on the rich data produced by competitive esports. Spencer has been speaking and writing on tech since 2013. As much as I like OBS, tis article is hardly a 'how-to', since it does not provide installation, configuration, nor operating instructions. The 'few basic sources' listed to create a stream, are extremely basic is far from what a seasoned streamer would use. Ideally you would want to clone your monitor and feed that second video into a capture box to a second computer dedicated to encoding/streaming. You would also want to feed that second computer a clean webcam or dedicated video camera feed, including a separate audio feed. There is a lot of configurations to adjust even with the most basic setup, and unless someone is walking the user through the process step by step, a lot of mistakes will be made, until the configuration that works for your system is set through an extensive trial & error procedure. Thanks for the feedback! I was trying to show the power of the tool and what it can do, not build a step by step guide. Honestly there is so much to do in OBS it could fill an entire book. It's a good read, but i understand what Salvador means. I think the title would be better without the "how to" so it just reads "Livestream games like the pros with OBS". Anyway, thanks for a inspiring article Spencer! Thanks for taking the time for making this tutorial, really appreciated. I always create screencast with a web-based software calls Acethinker Online Screen Recorder, It's a free web-based application to record computer screen right from the browser, share it here as an alternative to OBS. Thanks for this article, it has come along at exactly the right moment for me. Downloading OBS Studio right now.